Garden fall leaves can be a pretty big nuisance, I know. So let me show you how to - clear up the leaf litter fairly easily - recycle hedge trimmings and - make a most valuable organic compost ingredient: leaf mold. Clear-up in 3: Gather Together - Move Pile - Recycle or Dispose. Although I describe simple gardening methods here - I do find product reviews and discussions show that they are sometimes simply neglected. Click here to Bag It! Leaf & Lawn Rakes - Tip-Bags popular! 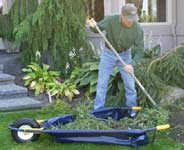 - Wheel Easy & Barrows; Leaf Shredders - Blow-Vacs - Shredders & Chippers. Wet leaves on my lawn in autumn, kills grass and causes bare patches. Your approach to the problem depends on the area of your garden, and the time and number of gardeners available. You can easily brush dry fall leaves and debris - nuts, small twigs, stones... off well-kept lawns, or driveways. Adjust the handle to a comfortable height. In suburban environments machines make a heck of a noise. This manual lawn sweeper is light, you simply push it and the job's done. Small gardens and tight spaces, are most easily tackled with an adjustable span spring tined rake (U.K.) - American rake available here . Folding also makes storage easier. Spring tines can be used to manually de-thatch lawns - but that's a tougher job. Wide leaf rakes help in gathering leaves over large areas - what about this plastic tined amazing reversible Pivot Rake or on this link a 'gentle on grass' metal Long Span Rake head that's also suitable on soil beds. You can tackle large areas with wide lawn rakes when you have sufficient time and workers at your disposal. Alternatively wait for a dry day and use the blower function on a blow vac. This makes a leaf pile fairly quickly. As with raking, you need to use a regular sweeping approach to blow fall leaves, from one side only, towards a fence, hedge or tree trunk. Vacuum up any sticky leaves or larger debris that won't blow away. Blow-Vacs have shortcommings. Noise and, despite shredding leaves into an integral bag, this can't contain a large leaf pile without needing emptying several times. I'm looking for a Blow-Vac with flexible tube to carry waste to a large free standing bag. Also, for use over large areas, a gas or battery powered Blow-Vac is better than mains electric. To be honest, I dislike them in domestic gardens. You can use a specialised leaf shredder to compact the fall leaves pile straight into a Tip Bag from where it can easily be moved all in one go. Place leaf shredder next to the leaf pile and use plastic hands to transfer heaps of fall leaves. Long electric extension leads are also available. I find these strong purpose-made, stay open waste bags to be indispensable. Plastic bin liners are a waste of time - they easily burst and don't stay open to fill. fold flat to store away. and there's a big choice of easy to use waste bags and sheets available to U.K. gardeners here . I specially recommend the large 8.9 CuFt (fold away) Landscaper Bag for autumn gardeners in U.K. Surprise! I find when I don't empty them, but leave my grass cuttings for any length of time, it heats up well and composting is under way. So the bags can be used as improvised compost containers. With a small garden the Wheel Easy comes into its own. At last wheel barrow design moves forward with a Wheel Easy - simple yet effective. A garden sheet with a wheel. However Tip Bags and plastic hands are better for handling larger amounts of fall leaves. The sturdy high quality build with 350 lb load strength proves this is no gimmick - check the FAQ 's here. Actually the Wheel Easy is strong enough to move small rocks and logs, as well as weeds, shrubs etc... The Wheel Easy levers up its load easily and a low centre of gravity makes it more stable - not top heavy like a conventional wheel barrow. A big advantage comes because Wheel Easy lies flat on the ground enabling you to rake, brush or roll straight onto it, no need to pick up. Of course Wheel Easy doesn't tip like a wheel barrow does. It comes in 2 sizes: 69" with rest handle supports, and 52" long. Wheel Easy has one final very popular 'trump card' over a barrow. That is it can fold flat and hang up for compact storage against a wall. - organic gardeners regard fall leaves as a fortune from heaven because they can be made into leaf mold. Leaf mold is great for making seed and potting compost mixes and mulching around fruit. How to make leaf mold and use it. Find how to make garden compost here. When you search for Garden Shredders you get lists of products to buy - on this page I explain how garden shredders work & how they suite your needs with added recommendations.